Had it been one of those unbearably hot southern Ontario summer days, I may have ventured inside for a look around and a quick one, but it wasn't. Anyway, I prefer my beer with more alcohol, and more flavour. 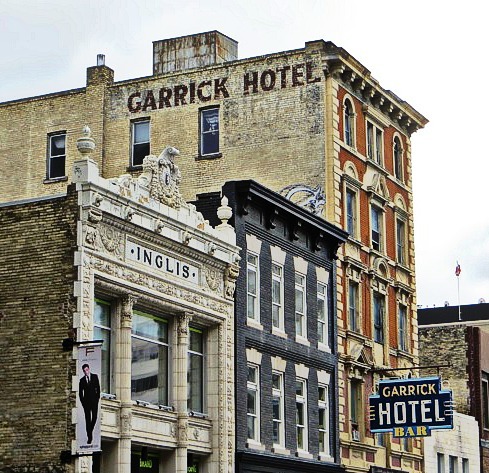 The Garrick Hotel was built in 1906, making it 110 years old this year. I'm sure it has a storied past, especially during Prohibition which started in 1916 and wasn't repealed until 1921, by which time the Wellington Hotel (the original name) had suffered one too many liquor violation fines and was sold by the bailiffs. 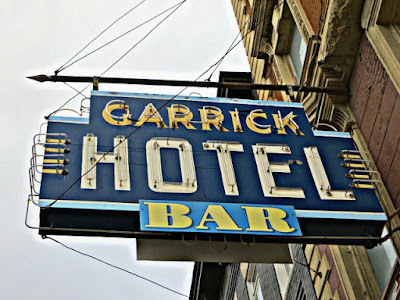 The Garrick opened a year later after a makeover but while Prohibition was over there were still many alcohol restrictions and it was raided several times until finally being shut down in 1924. New owners re-opened it, but then the Depression hit which ruined many of the hotels and bars with owners simply walking away and abandoning their debts. Creditors were mostly the breweries who would often take over the premises. Shea's Brewery were the lucky ones to inherit the Garrick. 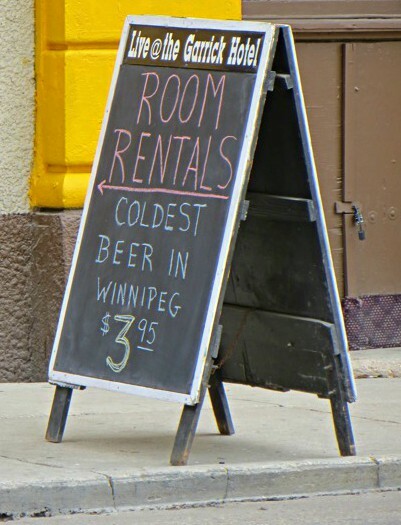 By 2008, it lost its vendor's licence and became the only historic hotel in downtown Winnipeg to not serve beer. Things improved so much by 2014 that it won an Achievement Award for "best business transformation in downtown Winnipeg". It is now described as a downtown bar venue with vintage ambiance with state of the art sound, lights and special effects. You can still see the faded sign for the original name Wellington Hotel. Interesting! Historical building would be fun to see. No beer, tho. I expected it to be a dump inside, but maybe not. It really has a nostalgic look. Lots of history there! And the neon sign looks in good shape. I wish I'd gone by to see it at night. Isn't it cool?! A lot of downtown Winnipeg was built in Chicago style architecture and is still standing. Those are great classic signs. Lovely old buildings. Winnipeg is full of great signs - though I think this may be the best neon one. Wonderful signs, Violet! 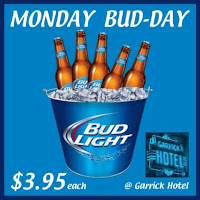 Bud Light - yuck!! The whole row of buildings is beautiful. and each building so different from its neighbour! I wonder if they still advertise the coldest beer in a Winnipeg winter?! 'Winnipeg' and 'cold' do go hand in hand, don't they?!! Wow! Those buildings are amazing! I just love old architecture. Great find, and good beer info! I never expected to learn something about beer. 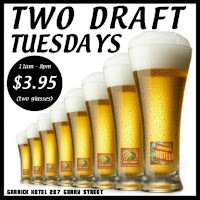 We like beer ice cold in Australia too! Thank you for taking part in the Travel Tuesday meme, hope to see another of your entries there this week! 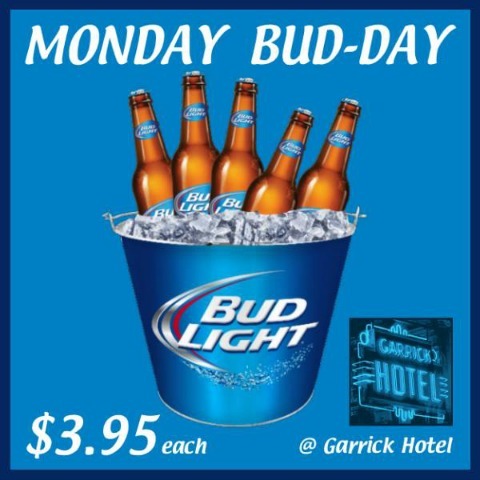 The light beers you mentioned are not ones I'd go for, even cold. I do, in fact, like my beer quite cold, but I like it very hoppy. Give me a good IPA any day.